MyOneManBand is the alter-ego used by live improvisational musician and sound artist Phill Wilson. MyOneManBand creates unusual electro-organic music in real-time by playing and sampling sounds from traditional instruments such as piano, guitar, dulcimer, kalimba, and hand-drums and mixing them with live MIDI sequencing to provide drones, glitches, synthetic textures, electronic beats, bleeps, squelches and hiss. created my own hybrid method of Audio and Midi routing that is perfect for the music I wish to make and allows the musical structures of my work to remain completely open-ended and flexible so I can add and strip away layers in a non-linear fashion. field.I am on a creative journey that does not expect reward financially or through the more conventional measures of success, but rather I hope to find value in my work through the people who I meet during its undertaking and the ideas and understandings that they bring into my life. 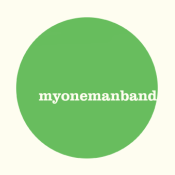 MyOneManBand in its latest incarnation revolves around a very specific paradigm. The music is all performed live and created from a blank canvas in real-time. Each improvisation is written and arranged in the moment, on the spot, using a form of “instinct composition”. This kind of music is free from the constraints of traditionally composed songs which become increasingly irrelevant or unfailthful to the moment of performance with the passage of time. The only premeditation that may happen before a show is in the selection of any speech samples that may sometimes be used to underpin the thematic variance of individual songs.There may also exsist a predisposition to a certain selection of instruments at any given gig and therefore an abridged palette of sounds, although this in itself is more often then not dictated by setup-time and available transportation for my equipment then any intentional auditory process of elimination. The benefits of this completely spontanious method of playing are many-fold, the audience is now presented something that is in constant flux and the performance is therefore always as exciting for both the musician as for the viewer; every night is the first night of a new release. There is now no plateau on which a body of work can become stagnant, there is now no “final product” to worry about...just an ever changing body of work that can remain current whilst also being supported artifactually by a growing archive of videos and recordings.